No, I'm not backwards, I'm just running backwards! And boy do I feel ridiculous. However, it has to be said, I can feel myself using different muscles from the ones I use during my 'normal' runs. When I run backwards, I run on my toes for one thing. Another muscle also gets an unfamiliar work out and that's the muscle in my neck! I keep straining my neck to see what's behind me, or should I say: 'in front of me'? Why would you wánt to run backwards? That's a good question, if ever I heard one! Let me try to offer some wisdom. From what I hear you burn more calories running backwards than forwards. Also, backwards running heightens your senses, because you have to really concentrate on not dying because you tripped or ran into a ravine. Another thing is that if offers your forward running muscles a break. 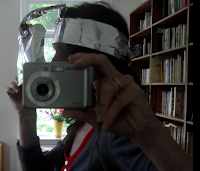 But the best answer is of course, then you get to wear my great Runner Reverse Mirror! For now, I'm going to keep on running forwards, but I may add a little backwards running at the end of my runs. Just to add the spice of fear, and as a way of cooling down. Are you a backwards runner? Love this! I was NEVER runner as a kid/young adult, but when we had backwards races in gym class, I was often one of the fastest. My problem is, I also am very clumsy and often fall down. :) I think I might give it a try though. Love working those different muscles! We used to run backwards in our kick boxing class, and I loved the way it felt. I'm actually more comfortable backwards than forwards...weird. That mirror thing is funny. Thanks for linking this up on our Fit & Fabulous Hop! I ran backwards about 1 miles once to avoid running into the wind when it was 30 degrees below zero with the wind chill factor. My eyelashes kept freezing together and running backwards was the better option. I was sore the next day though.